Submitted & written by Brandy P. Originally posted on May 14, 2011 at My Jumping Bean and reposted here with permission. January 19, 2010…this date probably doesn’t have a significant meaning to you unless it happens to be your birthday, anniversary, or some other milestone with cause for celebration. For my family, that was the day our world got turned upside down. That was the day our baby girl got diagnosed with the dreaded “A” word…autism. We noticed at around 18 months old she wasn’t hitting some of the same developmental milestones other babies her age were hitting – not responding to her name, hardly any eye contact, only 1 or 2 “words” like mama, dada & not directed towards us. I was in complete denial at first – no way, not my baby. At her 2-year check-up we told her pediatrician about our concerns & she immediately told me to call Early Intervention, that it was probably just a speech delay. I made the call the very next day & the process started. Countless evaluations later, the services began & she was receiving occupational & developmental therapy twice a week. (I should add that EI only goes up until they’re 3 yrs old). 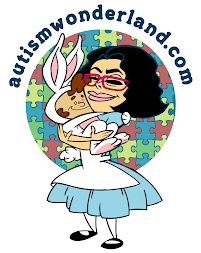 A few months into EI, one of her therapists suggested that we take her to a neurodevelopmental pediatrician, which I dreaded taking her to, b/c I knew that was the doctor who could give the autism diagnosis. I was pregnant with Logan at the time & close to my due date, so I made the appt. for Jan. 19th. I can’t tell you enough how much I was DREADING this appointment. January 19th came & I prepared myself as best I could to hear the “A” word, or so I thought. We got into the office & the neurodevelopmental pediatrician had 5 or 6 toys layed out on the floor, & the entire time she observed how Bean played with the toys, or tried to play with her; she also asked me a ton of questions. I was so nervous every time I saw her jot a note down on her clipboard that I felt nauseated. Once she was done with her observation, she looked at me & told me, “from my observations, I would diagnose her with an autism spectrum disorder.” All my so-called “preparedness” went out the window & I could feel the tears welling up in my eyes and a sharp pain in the back of my throat. The doctor started laying pamplets down in front of me for autism support groups, and various other information with the infamous puzzle piece on them. I was in shock. Is this really happening to me? To my baby?? We left the office & I could barely speak (which most people know doesn’t happen often). As soon as I got to my car I broke down.I almost felt like I was mourning the loss of a child, when I had my beautiful, healthy, perfect baby girl right in the back seat totally happy & content. It is the hardest feeling to try to explain to people. As soon as I got home, I went right online & started researching anything and everything I could get my hands on regarding autism. The first thing I looked up was to make sure that autistic people have normal lifespans, which everything I found assured me that it doesn’t have any affect on length of life. Of course, that wasn’t enough for me and the next morning, I called the doctor just to double-check. She laughed & again assured me that it has absolutely no affect on lifespan. Ok, I’m good now. WRONG. I was a complete mess. I would start talking about it to my husband, or my parents & break down in tears – I could barely get through a sentence without getting upset. And now we have her baby brother – is this something we’ll have to worry about with him?? My mind was racing all the time. As time passed, and I researched more, I realized that I only wanted to hear the positive things. I didn’t want to hear anything negative. I found so many websites of parents saying “my child has autism so he won’t do this, or can’t do that. How do they know? Do they have some secret time machine that they’ve somehow kept under wraps from the media?? Give these kids a chance! I was furious after seeing that site. After that, I realized that I only wanted to see the positive side of autism, the hopeful side. Any time I start to feel down, I think of these poor families with children in St. Jude’s Hospital – how awful must that be?! Thank goodness I have a healthy, happy child who doesn’t have a life-threatening illness. Once Bean aged-out of Early Intervention, we immediately put her in the Preschool Disabled program in our local school district. Her birthday is May 1st, so she was able to start in the extended school year (ESY) & get all the therapies that she needed right away. Currently, she is in full-day preschool and making progress every day! Her teachers & aides told me that it’s scary how smart she is, b/c she can figure things out that other kids can’t!! She does 1/2 day in preschool disabled & the other 1/2 in the autistic preschool class. She also gets speech therapy, physical therapy & occupational therapy a few times per week. In addition, we take her to an outside speech therapist who coordinates with her school speech therapist. I can’t tell you how much I recommend putting autistic kids in preschool as soon as possible. See if your school district offers the ESY. Once you get them into the preschool program, they will develop an IEP (individualized education program) for them based on their needs & the goals that you have for them. You are the best advocate for your child. It took me about a year to really be comfortable telling people about Bean, not b/c I was ashamed, but b/c I was afraid that she would be treated differently. I didn’t want the label of autism to be the first thing people thought of when they heard her name. She is so much more than that, autism is just a part of her, it doesn’t define who she is. Once I really learned about it & let everything marinade in my head, I realized how much I wanted people to understand what this is. So many people have misconceptions about what autism is & that needs to change. I became “Captain Autism” in a sense, promoting awareness anytime I could. I recently joined a support group through an organization called FACES Autism Support Network, and am so excited to be a part of it. The bottom line is, Bean is still Bean, she just happens to have autism. Just like someone who wears glasses happens to have bad vision. It doesn’t define who she is, and it makes her unique in so many ways. We are more proud of her b/c we know how hard she has worked & how far she has come. Don’t get me wrong, we certainly have our bad days, or days where it seems like there’s no light at the end of the tunnel, but the good days totally outweigh the bad. Originally posted on May 14, 2011 at My Jumping Bean and reposted here with permission.